Jewish Veg isn’t just a Torah-based vegan-advocacy organization. It is also, in a very real sense, a Torah-based environmental organization. That’s right. An environmental organization. Our sacred Jewish texts convey a strong environmental ethic. And livestock agriculture, unfortunately, is creating massive environmental degradation, in violation of Jewish values. The bumper sticker “Real Environmentalists Don’t Eat Meat” actually makes a great deal of sense. Consider, if you will, the Jewish mandate of bal taschit, or thou shalt not destroy, which comes from Deuteronomy 20:19-20. The verses explicitly forbid the chopping down of fruit trees in a wartime siege. Based on this, the authors of the Talmud issued a general prohibition against waste: "Whoever breaks vessels or tears garments, or destroys a building, or clogs up a fountain, or destroys food violates the prohibition of bal tashchit" (Kidushin 32a). With this in mind, the waste associated with meat production can be considered a blatant violation of “bal tashchit.” For instance, in their landmark book “Population, Resources, Environment,” Stanford Professors Paul R. and Anne H. Ehrlich stated that the amount of water used to produce one pound of meat ranges from 2,500 gallons to as much as 6,000 gallons. Even at the low end of that range, it’s still 20 times the amount of water needed to grow a pound of wheat. That’s some serious waste. That’s water use. What about land use? Almost one-third of the land area of the Earth is consumed by livestock, either for grazing or to grow feed for the animals. As a planet, we are using about 8 times more land for growing feed for animals than we are growing food for humans. 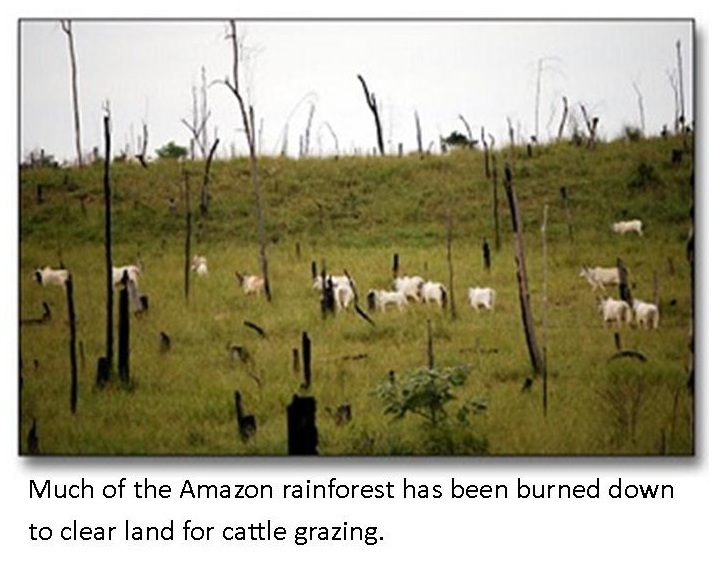 According to the World Bank, a staggering 91 percent of the deforestation in the Amazon rain forest is attributable to grazing livestock and growing livestock feed. Globally, according to a study by the World Preservation Foundation, up to 80 percent of all deforestation is the result of animal agriculture. Think of all the natural habitat we could preserve if people ate more plants and less meat. “Desolation” is a good word to describe the effect of the astronomical amount of sewage emanating from livestock operations. According to the U.S. Environmental Protection Agency, a single dairy cow produces about 120 pounds of wet manure per day, which is equivalent to the waste produced by 20–40 people. All totaled, the 3 billion farm animals that are alive at any given time in the U.S. produce 130 times more sewage than does our country’s human population. And much of this finds its way into our rivers, streams, estuaries and bays. Large, algae-clogged dead zones have formed in the Gulf of Mexico and Chesapeake Bay, in large part because of the amount of animal sewage flowing into them. Perhaps even more disturbing is the impact of meat production on climate change. A 2006 United Nation report revealed that the “livestock sector” generates more greenhouse gas emissions than all the cars, trucks, trains, ships, and planes in the world combined. The livestock sector is one of the largest sources of carbon dioxide and the single largest source of both methane and nitrous oxide emissions. This takes into account the methane from the belching, flatulating cattle, the gases released from the manure that they produce, the oil burned taking their carcasses to markets often thousands of miles away, the electricity needed to keep the meat cool, the gas used to cook it, the energy needed to plough and harvest the fields that grow the crops that the animals eat, and pumping the water that the cattle need. In fact, reducing meat and dairy consumption is the single biggest thing you can do to alleviate global warming. If your four-person family skips meat and cheese one day a week, it's like taking your car off the road for five weeks. Moreover, in transitioning to an animal-free diet, we can produce immediate benefits for the climate. In contrast, transitioning to renewable-energy sources, while necessary, requires massive investment and construction. Yes, Jewish Veg is an environmental organization.